One such student was Preya Assip, who after graduating realised she wanted to become a nurse. She therefore enrolled in the fast-track PgDip Adult Nursing qualification at LSBU. Accelerated two year postgraduate diplomas are available in a number of health courses including: Adult, Children's and Mental Health Nursing, Therapeutic Radiography and Occupational Therapy. These programmes are a great way for students with relevant degrees to convert their skills to become a healthcare professional. 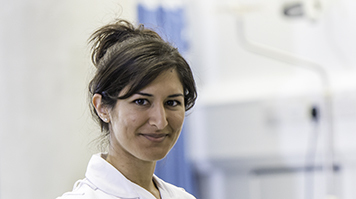 Preya's first degree was in medical science, and after taking a couple of years out to work as a Healthcare Assistant she realised she wanted to pursue nursing: "I met nurses who were both good and not so good at what they did, and began to see the impact those who did it well had on the patients, families, and the team they worked within. I remember thinking, 'I wouldn't mind giving that a go' – so I did." Preya made her mind up fairly early on that she wanted to study at LSBU. She wanted to study at a university with connections to the best hospitals in London. "The equipment and facilities available at LSBU are fantastic, including purpose built laboratories set up like hospital wards and simulation dummies. However, the main reason why I chose LSBU is because they are linked to so many of the large teaching hospitals in London – Guy's and St Thomas' and University College London Hospitals Trust. I wanted to have the best placements possible, which will also look great to future employers too. From working in acute areas of the hospital, to being out in the community and shadowing specialist nurse prescribers, Preya has gained a range of skills. "I had a maternity placement where I saw babies being born; I've been to theatre multiple times – stared into an open chest and watched a heart stop beating. I've watched post-mortems and been able to identify cause of death – I have seen things that I never thought I would get the opportunity to see. Nursing is like nothing else – even after qualification, there are such a range of areas that you can specialise in. "The fast track postgraduate diploma experience has been incredible; although it hasn't been easy simply because of the amount of placement hours alongside academic work that has to be done," Preya adds. "The placements have been the best part for me." Preya is now working in a central London hospital as a staff nurse working within the oncology department, on one of the oncology in-patient wards. Preya remarks, "It's going well - the transition from student to staff nurse hasn't been easy, largely because it's a big responsibility, but I feel like I was well prepared for it. I got into some good habits as a student and got a lot of practice in the smaller tasks over my two years of placement. My future plans are broadly to get more experience in maybe one or two more specialties, and then hopefully do a Masters."